There are many great articles that explain wonderful ways to fight and land a steelhead. 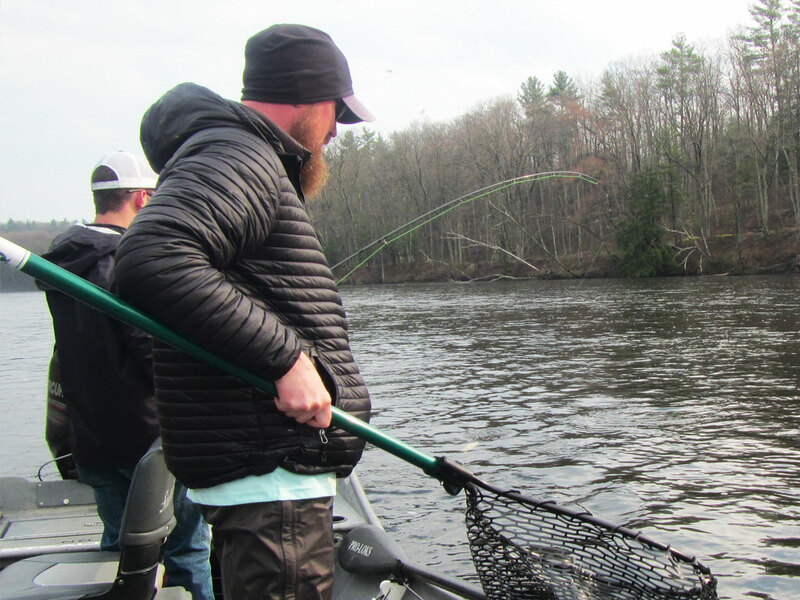 The advice is solid, the tactics work and they all prove there are many ways to get from A to B and successfully land a steelhead. If you are skilled at landing steelhead, in all likelihood you can attribute that success to past failures. Learning what to do is a result of learning what you ABSOLUTELY SHOULD NOT DO when a steelhead eats your fly. SETTING THE HOOK UP INSTEAD OF TO THE SIDE: When you cast, step and swing 999 times in a row, the angler often enters a mechanically meditative Zen stupor. When a tug happens or a bobber goes down the angler is startled and instinctively launches into a Bassmaster Classic hook set straight into the air. This action will either dislodge the hook at that very moment or repositioning it in a place where the fish will come unbuttoned sooner than later. Better to slowly sweep the rod to the side until you feel the tension, wait for the deep pull, then “nudge, nudge” to bury the hook. LEAN AGAINST A FISH AND LIFT IT TO THE SURFACE: Leaning into a taut line until your rod bends deep and lifts a fish to a surface is bad. Very bad. It ends with the beast alligator rolling on the surface and quickly releasing itself. This action usually occurs immediately after the hook set. If you find yourself walking backwards upstream and lifting your rod high over your head to keep a deep bend in the rod, stop. Relax, keep the line taut and enjoy the moment instead. PLAY TUG OF WAR: If you pull when the fish pulls, the hook is going to come out. It’s that simple. Never, ever, ever play tug of war with a fish. If the fish pulls, let it take line. When the fish isn’t pulling, reel. PALM REEL / ADJUST DRAG: I don’t know why any angler would invest hundreds and hundreds of dollars in a reel that has a space-aged, sealed drag system then override it with the inconsistent friction of the palm of their hand. Sure, it looks cool, it keeps your hand busy, a lot of anglers do it (some successfully) but it is absolutely no different than adjusting the drag knob mid-battle, only worse. A properly adjusted drag lets the rod fight the fish. The rod bends when a fish pulls but it does not let the fish pull the rod down to the surface of the water. Start with the drag one smidge over free spooling and slowly increase it after each battle until you find the sweet spot. Note that current speed is more important in drag settings than size and strength of the fish. The same size fish will impart greater force in currents running at 2000 CFS than 200 CFS. Always err on the side of too little drag than too much (see again tug-of-war). TRY TO STOP A RUN: Unless the fish is making a beeline into a gnarly logjam, there is absolutely no reason to try and put the brakes on a fish that is rocketing through the current at warp speed. Relax, hoot, holler, giggle and listen to the drag sing. This is why you have backing on your reel in the first place. Reeling in 50 to100-yards of line with a fish attached is much more fun than reeling in slack line. If there is one absolute in battling large fish it’s line that is too tight will unbutton more fish that line that is too loose. Relax, breathe, and enjoy the moment. You waited a long time to hook this fish, why rush landing it?